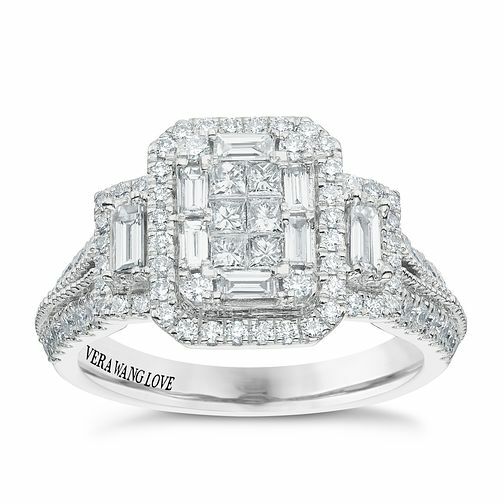 Vera Wang 18ct White Gold 0.95ct Diamond Cluster Ring is rated 4.5 out of 5 by 4. Rated 5 out of 5 by Anonymous from Ring Stunning ring, very happy with the overall service received. Rated 4 out of 5 by Anonymous from Beautiful ring This ring is so beautiful and heavy . It sparkles amazingly. It looks more expensive than it costs. One woman told me it’s a magnificent ring and was looking at her own with disappointment another told me it’s a statement item. Love it. My only disappointment was it does not come with a certificate which I expect when purchasing a diamond.